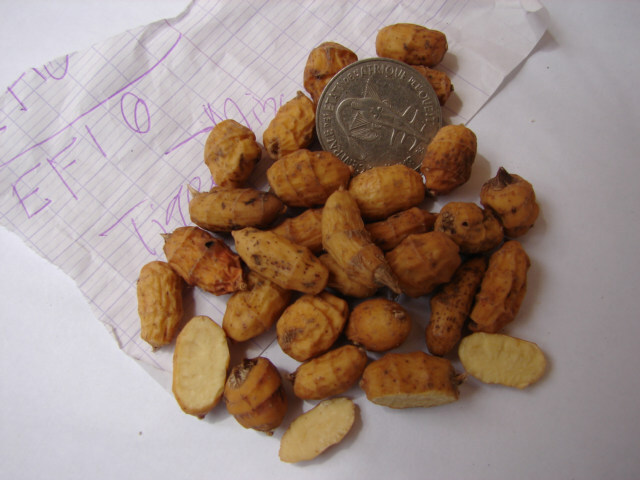 This is called Efio in the Mina language of Lome, Togo, and the Nigeria man called it Tiger Nuts in the Nigeria English. I suspect the reason is because of the stripes on the side. It taste something like a raw peanut, but peanuts taste much better. I think this nut has arrived in season or they are harvesting them now, as I now am seeing them sold. This handful of Tiger Nuts cost about 25 CFA or maybe 5 cents US. This is another of the mysteries I encounter daily, what is this, why, where, how, etc, it is easy to see why curiosity killed the cat. What is this? Does it grown on tree, in the ground, what is it?